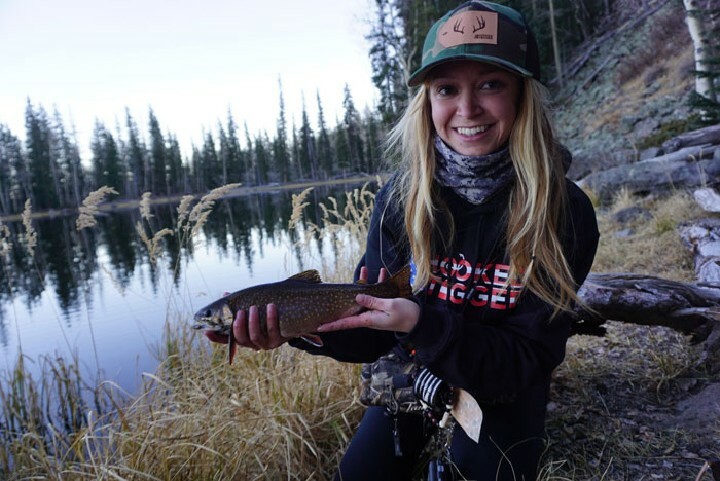 Colorado is hailed for having some of the best trout fishing waters in North America. It offers opportunities at trophy size rainbow trout and brown while immersing you in breathtaking scenery. 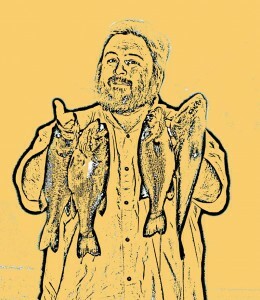 There are multiple rivers that have Gold Medal designated waters offering you a chance a truly once in a lifetime fish. 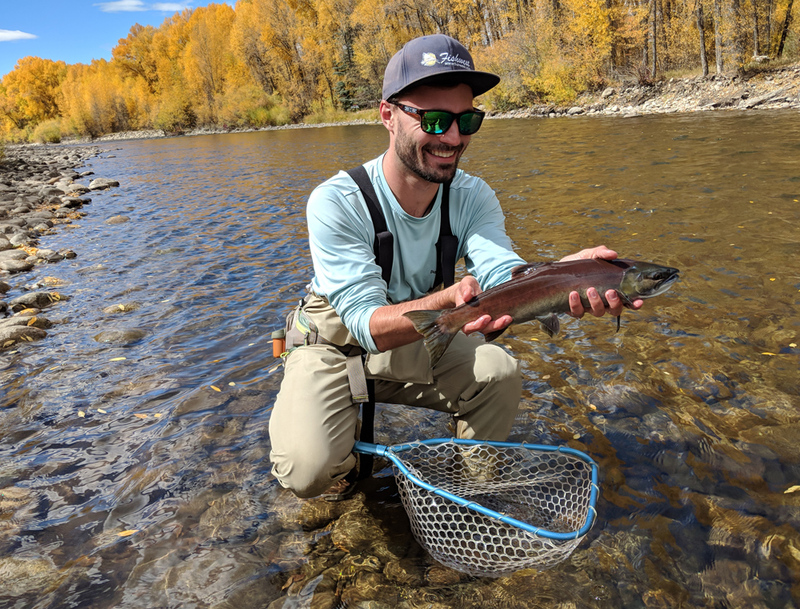 So when I had heard a couple of friends from college had moved out near Denver about a year ago and asked if I wanted to come fishing I jumped at the offer. We mulled over our options and decided that the we were going to hike into some alpine lakes, setup camp and fish for cutthroats for a few days. June was fairly open in all of our schedules so we settled on a date and decided June 7th-11th was best. I was looking at purchasing a plane ticket a few days later when I got a text asking if I’d want to fish the salmonfly hatch on the Gunnison River instead. Now I’d have heard of salmonflies before, but all I really knew was that they are large and trout love them. I also had no prior knowledge of the Gunnison River and that a salmonfly hatch occured on this river. After a little research we changed our minds and decided we were growing to try and tame the Gunny. The stretch of river we decided on was a stretch known as the Black Canyon which was Gold Medal water. The canyon is a very unique area and has vertical walls that exceed 2000ft. I had four months to prepare for the trip and absorb whatever knowledge I could on the Gunnison River and it’s magical salmonfly hatch. I frantically tied as many salmonfly flies as my hands would let me. The nice part about salmonflies is that they’re fairly easy to replicate due to their large size. In nymph form tying a Pat’s Rubber Legs is an excellent representation of the salmonfly nymph. A size 4-10 seemed to cover the range of salmonflies we observed with majority probably being in the size 4-6 range. A couple wraps of .030 lead and a bead was the ticket to fish some of the deeper pools with faster moving water. For the adult salmonfly a Henry’s Fork Salmonfly with a shot of Gerkhe’s Gink to keep it riding high worked. You could tie this pattern with either bucktail if you wanted it natural or foam if you prefer a synthetic pattern. The foam rides higher and stays much drier whereas the bucktail will sit lower and you have to make sure you keep it dry enough. Neither really seemed to outfish the other during our trip. As I stacked my box with flies and prepared myself for the trip the days flew by and sooner then later it was time to leave. The day had finally come when I was slated to leave and see what Colorado was all about. I got out of work, threw my gear in the truck, and 5 hours later I was standing in Denver airport waiting for my friend to come and pick me up. We left early the next morning and made the 5 hour trek West to the river. The ride out there offered incredible scenery as we cut our way through the Rockies and snaked our way through the hills and valleys talking of giant trout and the adventure that laid ahead. We stopped in the Gunnison Fly Shop to gather some intel and see how the hatch was progressing. We were happy to hear the hatch was moving nicely into the Black Canyon and fish were being caught. Leaving the shop with high hopes we practically ran back to the truck dreaming of big trout sipping our dries. Chukar Trail was our destination and where we were going to set up camp for the next few days. You could camp at the trailhead and then hike the 1.5 miles down the canyon into the river. In order to access the trailhead you had to drive down 7 miles of a very rocky dirt road until you came to the campsite. After a slow, painstaking we had finally made it to camp and set up shop. We quickly through our tents together, packed our fishing gear, and began the descent into the canyon to catch the evening bite. I’ll never forget walking our way down into the canyon teeming with excitement just waiting for the Gunnison to come into view. You finally get the bottom after what seems forever and then BAM! There’s the river nestled between two gigantic canyon walls. The emerald blue color of the water and the red and black canyon walls are truly a sight to behold. We surveyed the area and started working our way upriver gathering info on the water. We picked our way through slow water as we moved upriver launching giant salmonfly imitations as we went. We only had a few hours of daylight so we couldn’t go far, but we had a bunch of small trout nudge and push our salmonflies around until it got dark. We made our way back to camp, cooked up some ribeyes, and conversed about tomorrow’s gameplan. Tomorrow we would embark on a trip upriver bright and early hoping for the best. 4:30am came early so we fired up the coffee and got some breakfast going over the fire as we prepped for the day. We threw together some lunch, hammered a few cups of coffee, and fired up the headlamps and we descended into the canyon for an all day adventure. The hike down seemed to fly by and we soon were putting our waders on and journeying our way upriver to continue our exploration. We noticed some large stoneflies on the bank and decided Pat’s Rubber Legs under a thingamabobber would suffice. As we worked our way upriver we plodded through different pockets, runs, and seams waiting for the indi to drop and the line to become tight. We started to morning off with a few smaller fish mainly in the 8-10” brown trout and a few around 12”. Excited to be catching fish we knew it would be a matter of time until we finally came across a larger trout. We eventually came to a point upriver where you had to either work your way up over a cliff to continue moving upriver or you had to go for a plunge. Even though it was only about 11:00am it was already hot and we opted for the swim to help cool us off. We popped off our waders, packed our gear up tight and took a nice little swim. Nothing wakes you up more then having the air sucked from your lungs as you dive into nice cold Colorado water. Once on shore we dried off, threw our waders back on and were blessed with a beautiful pool just around the bend. I picked a nice eddy behind a large rock and made a couple passes through with my Pat’s when all of a sudden my indi was gone so I set the hook and the rod doubled over. 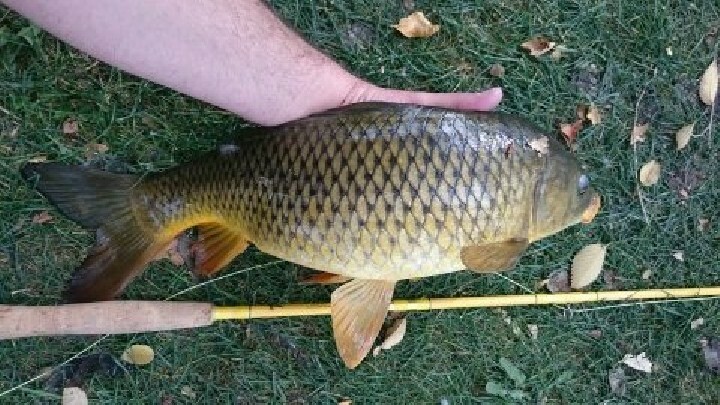 I had just recently bought an older bamboo rod and decided this was going to be the trip to christen it on. The bamboo rod doubled over as the trout went flying into the current and running downstream flying out of the water like a lunatic. After a few hard fought moments the fish was in the bag and we were looking at our first decent fish of the trip. She taped out at 15” and was safely released to swim another day. At that point I forgot I was still pretty soaked, I just sat down looked at the canyon walls and smiled wondering if this is what heaven looks like. The more we worked our way upriver the better the water got. Everything looked fishy to the point where you almost didn’t know where to fish. The pools were some of the best I’ve laid eyes, the seams and runs were juicy as ever, and the eddys and pockets seemed too good to be true. We nymphed our way through all of it picking at brown trout and laughing at how good the fishing was. None of us had expected to just show up and catch a bunch of fish, but low and behold here we were and we were actually catching fish. As the morning turned into afternoon we saw less nymphs and more adult salmonflies so we began to make a switch. Trout were feeding on salmonflies that were falling off the low cliff walls that overhang the river. They slurped them with violence and aggression that makes you “ooh” and “ahh” with excitement. They weren’t however eating our flies like they were the real thing and we couldn’t quite figure out why. Even though the trout were eating adult salmonflies they weren’t really truly keyed in on them. Overall we were about a week early in terms of when the hatch is in full swing and the fishing is on fire. We fished through the evening picking away at fish on dries and Pat’s and had lost one very large fish in the process guesstimated around 18-20”. It was a heartbreaker, but that’s fishing for you. As dusk rolled around we packed up our gear and headed out to wind down and get ready for another long day tomorrow. The alarms started blaring signaling our final day on the river and one last shot at a big trout. We ventured down in the dark again and got right to business going upriver to fish the same great water we fished yesterday. We started off the day with some nice browns on Pat’s in eddys and seams. There were a plethora of nymphs around in the morning covering the rocks alongside the river in large numbers. The fish were definitely keyed on the nymphs and that showed by how frequently our indicators were dropping. A lot of small fish kept us busy with some decent fish coming in between and the action staying consistent. As the morning wore off the nymphs started to hatch and adults were soon buzzing around everywhere. Some fish began to acknowledge this and the violent topwater takes started to show up more often. Recognizing this, we made a switch to dries again and found some trout that were interested. The takes on the dries were awesome with fish crushing the flies and engulfing them without asking questions. However as many as you hooked you also missed due to the violent nature of the strikes. Time was ticking on our day and after a while it was time for us to pack up and get moving as we had a long ride still ahead of us. We made our final casts, caught our last few fish, and drank in the last few moments of wild scenery. The trip overall was a huge success. We had no idea what we were getting ourselves and really didn’t know what to expect from the salmonfly hatch. It was a shot in the dark that we hoped was going to work and it sure did. The fishing was better then we could have asked for even though we didn’t catch our giant. You don’t always have to catch big fish for a trip to be successful, sometimes it’s just trying new things and going to new places. The scenery in the canyon was incredible and at times you had to remind yourself to sit down and look up to fully enjoy where you were. I would have spent 10x the amount of money it cost and not even thought twice about it. It was tough DIY trip, but it was worth every second. If you ever get the opportunity to fish the Gunnison for the salmonfly hatch I would HIGHLY recommend it, you will not be disappointed. I know we’ll be going back next June and we’ll be even more prepared and hopefully we can see some of the larger trout that the Gunny holds. Until then I’ll just be dreaming about fishing those waters again. For more adventures follow me on Instagram @luke_flywalker19 and please don’t forget to Carry Out what you Carry In to help keep our waterways beautiful and clean!